My last post talked about a vegetable called Kohlrabi. 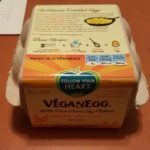 Since I am finding it at the local Farmer’s Market each week, I have been inspired to get creative and try new recipes with it. 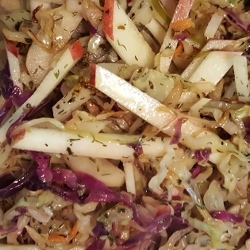 This week I bought some green and purple kohlrabi (they come in both colors) and I used them to make a delicious slaw. Very minimal cooking is required and it is great side dish for almost any meal! 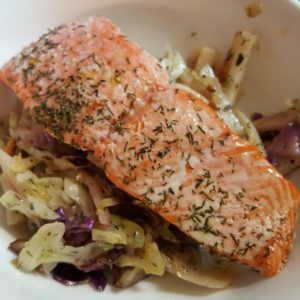 We had it with fresh and wild Sockeye Salmon fillets — super delicious! So, what is in this sweet and savory slaw? I used a few small kohlrabi (double the size of a golf ball basically), shredded purple and green cabbage, shredded carrots, and one really nice, juicy white nectarine. Add in some plain rice vinegar, olive oil, sweet basil, dill, and a bit of honey, and that is it. Chives or scallions also add a nice touch if you want a little more kick. The only cooking required is a light saute of the cabbage, carrots, and kohlrabi to soften the texture and flavors a little. FYI – even though it is cooked, I would still serve it at room temperature. Some people may like this slaw completely raw, but if you want to tamper down the flavors a little, I suggest cooking it. You can whip this slaw up the night before, and it will absorb all the yummy flavors overnight! Plus, it will save you some time the next day. Check out the recipe for full details! Peel and slice your kohlrabi into matchsticks. The easiest way for me to do this is: peel off the coarse outer skin using a knife, trimming off the sides in slices; once the skin is off, cut the kohlrabi into rounds that are about 1/4 inch thick; stack them in groups of 2 and slice them into skinny little matchsticks. Set aside in a large bowl (save this bowl for later too). For the cabbage and carrots, I use pre-shredded, organic cabbage and carrots for this recipe. It saves a lot of time and is readily available at my local grocery store. If you cannot find yours pre-made, use a mandolin to shred your cabbage. If pieces are longer than 2 inches, cut them so they will be more equal in size to the other foods. You can use a grater for making your shredded carrots if you can't find them either. Drizzle 1-2 Tbsp of oil in a saute pan. Put on medium heat. Add in your kohlrabi, cabbage and carrots. Let it cook for a minute or two and then give it a stir. Now add in your rice vinegar and spices and remaining oil. Let it cook until the cabbage starts to wilt and become 'shiny'. Once this happens, you can turn off your heat and transfer the food to your big bowl and let it sit for a minute. Slice your nectarine into similarly sized matchsticks and add it to the bowl of kohlrabi, cabbage, and carrots. If you're using scallions or chives, chop them now and add them to the mixture. Add the salt and pepper if you are using them. Then toss the slaw with a large spoon or tongs. Let it sit, covered in the fridge for 1-2 hours. Serve at room temperature. You can make this slaw 1-2 days ahead of time. It soaks up lots of flavor sitting in the fridge overnight. This can be made completely raw if you like the taste and texture of raw kohlrabi and cabbage. It is just crunchier and the flavors are a little stronger.